Help-U-Sell Greensboro closed 20 sides in May. May was a banner month for two of our offices, who closed 20 or more sides! Others made the list of top producers for the first time in a while, and some helped sellers with $1 million-plus transactions. Congratulations to all! 1) Help-U-Sell Honolulu Properties edged out second place by just one. Their 21 closed sides consisted of six buyer sides, nine seller sides, and three dual-sided transactions. 2) Barely missing a tie for first, Help-U-Sell Greensboro completed 20 sides: six buyer, 10 seller, and two dual-sided transactions. 3) With a lucky 13 closed sides, Help-U-Sell Triad Realty finished third. The North Carolina office had three buyer sides, eight seller sides, and one dual-sided transaction. 4) Alabama’s Help-U-Sell Quad Cities Realty closed two buyer sides, six seller sides, and two dual-sided transactions. 5) Help-U-Sell Direct Savings Real Estate did 11 closed sides. One buyer side, six seller sides, and two dual-sided transactions made up their total. 6) In a three-way tie for sixth place, Help-U-Sell Jeff Braun Realty, out of Wisconsin, did two buyer sides, four seller sides, and two dual-sided transactions. 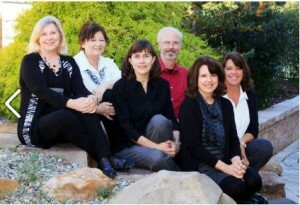 6) Utah-based Help-U-Sell Legacy helped four buyers and six sellers in May. 6) Help-U-Sell Options Unlimited, in Terre Haute, Indiana, rounds out the top producers with four buyer sides, two seller sides, and two dual-sided transactions. Three offices helped their clients sell $1 million-plus properties. Great job saving your sellers thousands of dollars, Help-U-Sell Achievers Realty, Help-U-Sell Greensboro, and Help-U-Sell San Antonio Hill Country! An eight-foot Help-U-Sell Real Estate banner led the Army of Red. 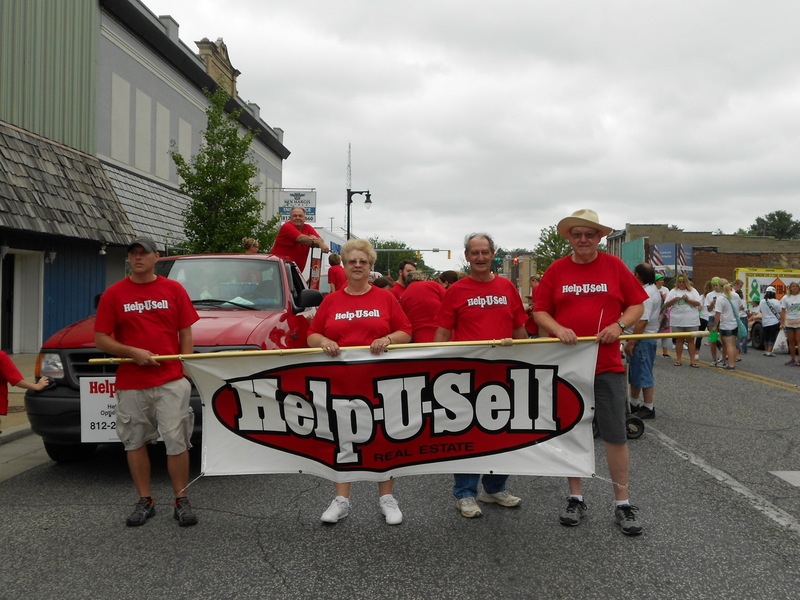 Help-U-Sell Options Unlimited‘s broker/owners Brenda and Robert Fischer love giving back to their community, and one of their favorite traditions is to march in the annual Terre Haute Labor Day parade. One of 48 entrants in the parade, the Fischers’ “Army of Red” consisted of more than 40 people all dressed in red Help-U-Sell Real Estate T-shirts. Family, friends, and past clients all handed out more than 2,500 informational cards explaining how Help-U-Sell Options Unlimited helps sellers save money. Two red trucks and five wagons/strollers with Help-U-Sell Real Estate signs accompanied the walkers, who carried an eight-foot banner. 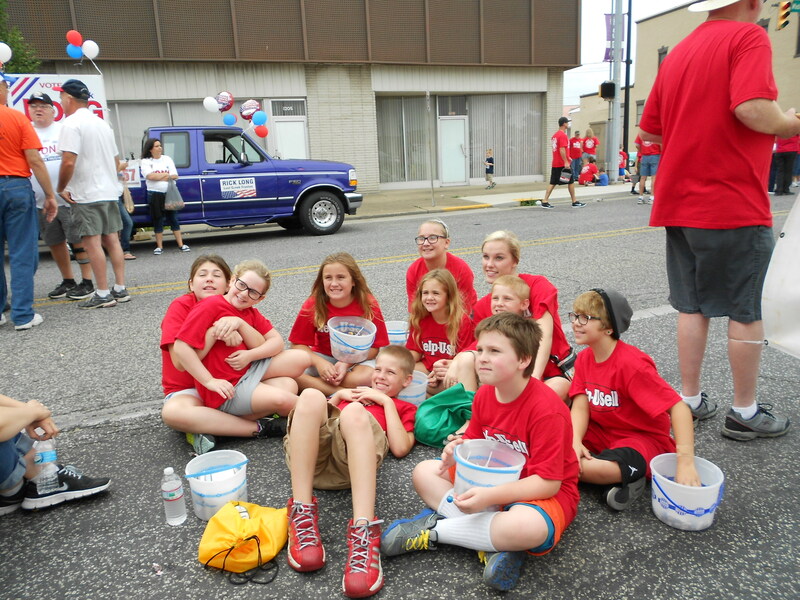 Help-U-Sell Options Unlimited's 'Army of Red,' made up of staff, family, and past clients, marched in the Terre Haute Labor Day parade earlier this month. “It was a lot of fun,” says Brenda Fischer. “We handed out over 6,600 pieces of candy.” The Labor Day parade is a perfect fit for Help-U-Sell Options Unlimited because “We want to support the ‘Labor Force’ and to give them an alternative to the ‘normal’ 6 to 9 percent real estate commission, in order for them to sell their homes,” she says. 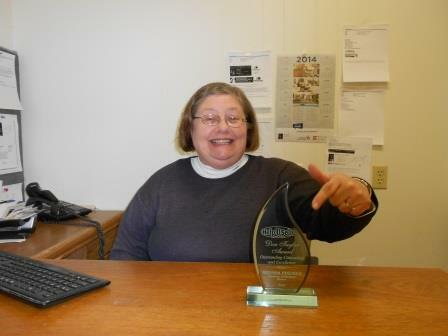 How do you participate in your community activities while promoting your office? Share how you’re involved in the comments. 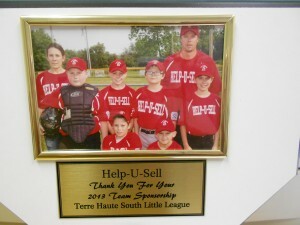 Help-U-Sell Options Unlimited sponsored the Terre Haute South Little League team this past spring. Real estate is ultimately a people business and a local business. So getting involved in your community makes a lot of sense from a marketing standpoint, and, of course, it can be emotionally rewarding and fun, too. 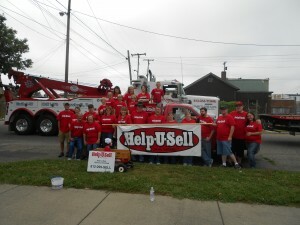 This past spring, Bob and Brenda Fischer of Help-U-Sell Options Unlimited sponsored the Terre Haute South Little League team, knowing the area was impoverished and, therefore, not attractive to other marketers. The Fischers attended games so regularly, Brenda was recognized by a team parent as a Help-U-Sell broker while she was at the supermarket. Sponsorship achieved brand recognition, but more importantly helped kids in the community get to play a game they love. Options Unlimited is sponsoring a team this fall, too. 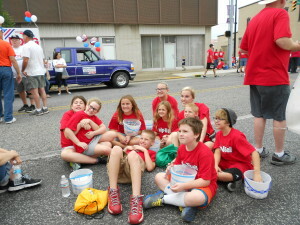 Options Unlimited’s support from the community showed earlier this month at the Terre Haute Labor Day Parade. The biggest Labor Day parade in Indiana, it was televised throughout the state. The Fischers mustered up 25 walkers. Besides family, agents and friends, the “Army of Red” contained previous clients who were “more than willing to participate,” says Bob. The Army passed out candy and promotional cards along the parade route. Options Unlimited has closed 23 sides so far this year in a metropolitan area of only 170,000. How are you involved in your community? What are your plans to get more involved? 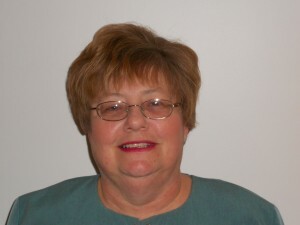 Brenda Fischer of Help-U-Sell Options Unlimited in Terre Haute, Ind. Fischer’s office attracts the leads that turn into listings and sales in a number of ways, many of which fit the “back to basics” theme. Every day, the office sends out handwritten notecards to all expireds and withdrawns in its target markets. Traditional advertising works for Options Unlimited also. “We advertise weekly in the Valley Homes Section of the Tribune Star newspaper. Last year, we had an insert in the Tribune Star, where we placed a flyer in the newspaper once a month for three months,” she says. “During the peak listing season, we advertise on the local radio station.” Fischer says it’s a 20-second commercial that promotes how her office can save sellers money. She uses her happy clients to help tell the Help-U-Sell benefits, too. “We get testimonials from anyone and everyone we can get them from – buyers, sellers, off Trulia and Zillow, etc. We place these in our local newspaper and on our website,” she says. “They are asking for more personal items than ever before, and they know which houses are priced to sell. Buyers are looking at a lot more homes than they did in the past, and these include homes that may not fit their criteria. They want to make sure they have seen everything that may remotely fit their needs,” she explains. Fischer says her office’s goals for 2013 are to have at least 50 listings by July 1 and to have approximately 65 sides in 2013. She intends to use her market analysis to plan when to advertise and where to advertise to get the most bang for her buck. “We are also planning a three-month trial period with Trulia and we plan to sponsor a Little League baseball team,” she says. As an almost six-year Help-U-Sell veteran, Fischer offers well-earned advice for new franchisees. “Some of the traditional real estate companies do not like our concept,” she says. “Kill them with kindness and be as helpful as you can to them.” For instance, she recommends making it easy to show your houses by being thoughtful about which lockboxes you use.